What's involved in arranging a seminar with Sam Masich? Perhaps you've looked at Sam's calendar and thought, "I'd like to take that workshop but its too far away," or even, "it's not at the right time for me," or, "its not the subject I'd like to focus on right now." Why wait for opportunities when you could be creating them? Sam Masich seminars are educational, fun and generally fairly easy to organize. One of the most versatile Internal Arts instructors in the world today, Sam teaches dozens of seminar topics and makes it possible for participants with a wide range of experience levels to work together. Take a look at the Studying with Sam page for topic ideas. Remember, themes can be combined and altered to meet the needs of your group. On the red side-bar to the right, you can download a seminar organizer's guide that will answer questions about arrangements, fees, promotion and more. As well, you can find an organizer's 'To-Do' checklist, a participants waiver, and a quick-list of when Sam is available in 2008 and 2009. 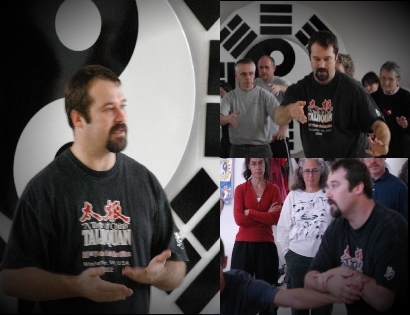 Generally, Sam prefers to teach traditional Yang Style Taijiquan and 5 Section Taijiquan curriculum along with supporting material (core principles, jue-shou, 13 powers theory etc. 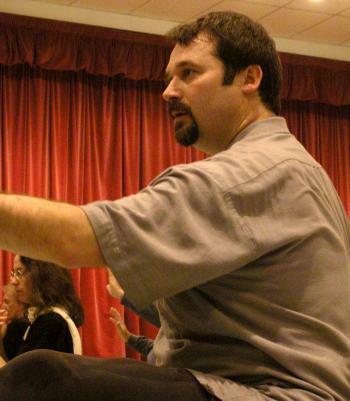 ), however he also teaches classes on a wide range of subjects such as: Xingyiquan, Baguazhang, self-defense, meditation, qigong, the Yijing and several theatre/performance topics. Sam focuses his most of his attention on groups that wish to develop over the long term, working curriculum thoroughly, to turn out high level practitioners and instructors. Many communities have a 10-15 year history with him. While he frequently teaches weekend workshops, Sam has been leaning more strongly toward 'special intensives', events of four-days or more, enabling deeper, more concentrated explorations of seminar themes. Every event is unique and each seminar organizer does things their own way. This down-loadable check-list provides some suggestions to help keep track of what needs to be done before, during and after an event. This form is to be signed by seminar participants before an event begins. It acknowledges that individuals understand the risks of participation and take full legal responsibility. It also allows that filming, photography and recording may take place, and gives consent for use of such media. Sam divides his time between Vancouver, Canada and Berlin, Germany. He can best be reached by email.